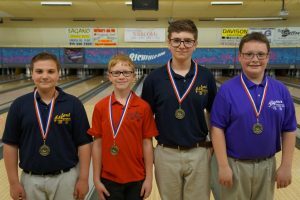 The Flint Metro Conference held the 6th annual Middle School Singles Championship Tournament on Sunday, May 15th at Richfield Bowl. 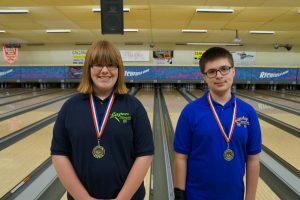 The tournament had a total of 80 bowlers which featured 36 girls and 44 boys this year, it was a slight increase from last year when the tournament was held at Grand Blanc Lanes. The boys qualifying was led by Nick Ruggles from Kearsley who totaled 770 with handicap and was way out in front of Gage Slagor also from Kearsley who totaled 773. These 2 were the only 2 bowlers to total over 700 for the tournament. 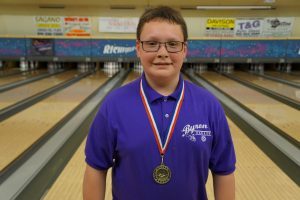 The excitement for the boys began immediately after qualifying was over as Justin Sisson from Oxford tied for the 32nd and final spot with Joshua Dubiel from Brandon and they had to have a 9th & 10th frame roll off to in front of everyone to see who would get the final spot in the tournament. Justin Sisson won the roll off and turned the momentum into a great finish as he began match play by knocking off the #1 seed Nick Ruggles with a 250 to 233 victory. In the mean time the #18 Jacob Field from Byron won a close first match by 2 pins and then in his 3 match defeated Ethan Burke by 1 pin to move into the final 4 where he defeated Andrew Petersen by 3 pins to move into the finals. Justin Sisson worked his way through the field by beating Brendan Ashley and Peter Mitchell to end up in the finals against Jacob Field. Justin Sisson fought hard in the finals but came up short and finished 2nd as Jacob Field won 242 to 218. On the girls side Stephanie Slator from Lapeer led the girls qualifying with a 679 series which included a 223 actual last game that swelled to a 274 game with handicap, this was also the highest game of the day for the girls. Slator finished 6 pins ahead of Emily Reid from Flushing who had a 673 total, unfortunately neither girls could turn their big qualifying scores into a tournament victory, Stephanie was defeated in the 1st round by Jillian Roush 192 to 174 and Emily was defeated in the 2nd round Olivia Passig 216 to 196. In the mean time the #20 seed Regan Kopesky from Byron was cruising with games of 248, 259 and 234 to reach the final 4 and on the other side of the bracket Rhyan Langdon-Yaklin from Kearsley was also cruising with games of 233, 230, and 240 to also move into the final 4. In the final 4 Rhyan defeated Olivia Passig 265 to 234 to move into the finals and on the other side Regan defeated Mya Bruno 262 to 237 to reach the finals. In the finals it seemed both girls may have ran out of gas but Regan Kopesky had just enough left in the tank to pull off the 216 to 187 victory and win the tournament. The win by Regan and the win by Jacob meant that Byron had both winners in this year’s tournament and also means look out for that Byron team in the next few years! Congratulations to all of the bowlers who bowled today, hopefully everyone enjoyed the tournament and the competition!